Voice-controlled digital assistants are being incorporated into a wide range of consumer products, and nearly half of U.S. adults (46%) say they now use these applications to interact with smartphones and other devices, according to a Pew Research Center survey conducted this spring. 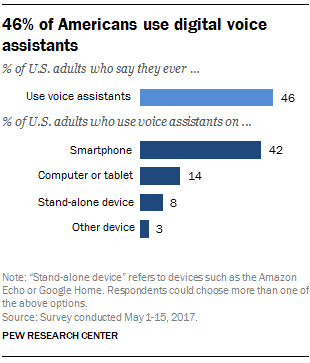 Voice assistants are present on a wide range of devices, but the most common way for Americans to use them is on a smartphone: 42% of U.S. adults use voice assistants in this way. Some 14% of the public has used a voice assistant on a computer or tablet, while 8% say they use them on a stand-alone device such as an Amazon Echo or Google Home. These applications are relatively popular among those ages 18 to 49: 55% of Americans in this age group say they use voice assistants, compared with 37% of those 50 and older. Presented with a number of reasons why they might use voice assistants, 55% of users say “a major reason” they use the assistants is that these applications allow them to interact with their devices without using their hands. Smaller shares say that they use voice assistants because they are fun (23% cite this as a “major reason”), because speaking to the assistant feels more natural than typing (22%), or because these programs are easier for children to use (14%). Voice assistants can also be used as “remote controls” of other connected systems such as car locks and home lighting and heating systems. About a quarter of voice assistant adopters (26%) say they use the assistants to connect remotely to other things. The survey also asked Americans who say they do not use voice assistants about their reasons for not using them. Some 61% of these non-users say they are just not interested in the tool. 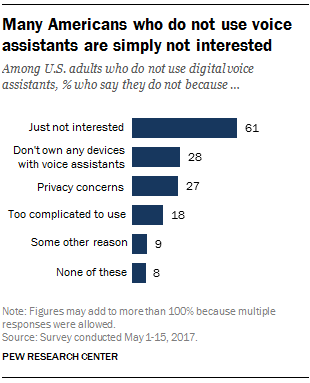 Around one-quarter of this group say they do not use voice assistants because none of the devices they own have this feature (28%) or because they are concerned about privacy (27%). And a slightly smaller share (18%) reports that voice assistants are too complicated to use. Note: Full methodology and topline are available here (PDF).